The conference room has a touch panel display that displays the current and upcoming meetings of the respective conference room. The display also allows users to book the room instantly and use the same. 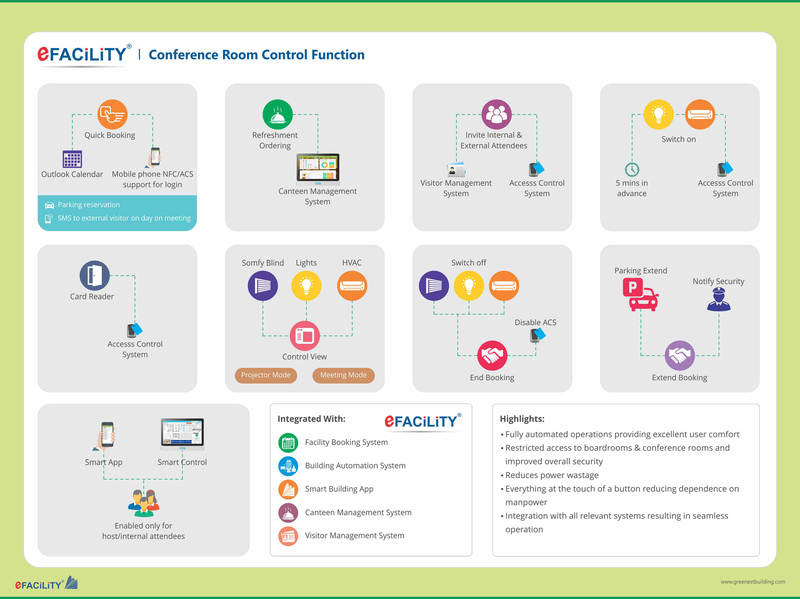 The touch panel also acts as a Bluetooth beacon that is detected by the eFACiLiTY® Smart Building App to open the facility reservation function displaying the respective conference room details making it easier to book using smart phones. The touch panel is also NFC enabled using which users can authenticate themselves to make bookings using their registered mobile phones or employee access cards. The conference room is access controlled and users are allowed access only when they are an invitee (external/internal) or host of the ongoing meeting or the upcoming meeting. Visitor badge works when he/she is an external invitee for a scheduled presentation. When people enter, surprisingly the conference room is already in the right ambience and the facility booking system allows the host to book a conference room, invite external and internal attendees, book car parking needed for the visitors, pre-register the visitors automatically with the visitor management system, order refreshments and in addition allows the host to set the required room temperature. The system switches-on the air-conditioning about 5-10 minutes before the meeting schedule to bring the room to the required temperature. The same way at the end of the meeting, after a grace time the system automatically switches off the lighting and air-conditioning in case the users forget to switch-off the same. If the meeting gets extended, the host has an option to extend the booking based on which the reserved parking lots are automatically extended, the security is informed about the extension to avoid visitor overstay security alerts and the lighting & air-conditioning controls switching off is delayed accordingly. Inside the conference room there is another touch panel which has provisions to switch to projection mode which brings the automated window blinds down and switches off some lighting getting the ambience suit the projection display. When the meeting mode is selected the automated blinds are set to auto-mode where-in based on the Sun’s current position, the window blinds gets adjusted providing maximum day light while controlling direct sun light inside to avoid glare and heat entry. The touch panel also allows to extend the booking – to use when the meeting gets delayed, order refreshments and a floor plan view of the lighting and air-conditioning controls for easy individual operation of the same. There is also an end booking option which can be used when the meeting gets over sooner than planned so that the room becomes free for anyone else to use and also switches off the lighting and air-conditioning immediately, sends information to the access control system to disable fresh access to the room and also updates the security desk.